The HudsonAlpha Tech Challenge, hosted by HudsonAlpha and Urban Engine, is a life sciences hackathon that brings together students and professionals who attempt to solve challenges using emerging technology and apply it to biotech and the life sciences. The Annual Tie the Ribbons luncheon, held at the Von Braun Center North Hall in downtown Huntsville, aims to raise funds and awareness for breast and ovarian cancer. Funds raised will support breast and ovarian cancer research at HudsonAlpha. This year’s luncheon will be held November 7, 2019. Click here to learn more and register. The Spring Benefit celebrates HudsonAlpha’s mission. Since our doors opened ten years ago, we have made tremendous strides in human health and agriscience research, provided science education to millions of students of all ages, and greatly expanded the bioscience footprint in north Alabama. The 2019 Spring Benefit will be held April 25, 2019. Click here to learn more about the Spring Benefit. The iconic Double Helix Dash 5K run and 1-mile fun run attracted more than 800 participants in 2018. One of the most unique races in North America, the race begins and ends on the HudsonAlpha campus and winds through the distinctive bends of the world’s largest double helix in McMillian Park. Proceeds from the Double Helix Dash support HudsonAlpha’s work with rare and undiagnosed genetic disorders, which affect some 25 million people across the country. The 2019 Double Helix Dash will be held April 2, 2019. Click here for more information and to register for the Double Helix Dash. Held each year in September, HudsonAlpha’s free public education seminar Biotech 101 is a great primer on how biotechnology affects everyday life. The four-week evening series teaches DNA basics and the relevance of genetics and genomics in medicine, agriculture and the environment. Registration opens up this summer. Check out https://hudsonalpha.org/biotech-101/ for more information. Ready for more biotech learning? The popular Biotech 201 series builds on the learning of Biotech 101. Held in February each year, Biotech 201 explores a number of different topics in genetics and genomics research. To learn more, visit https://hudsonalpha.org/biotech-201/. 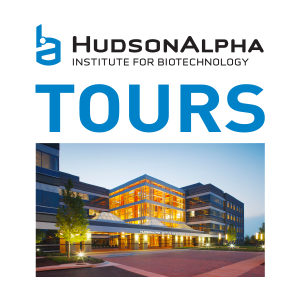 Do you want to learn more about HudsonAlpha Institute for Biotechnology? Join us for a free tour of the entire Institute. You’ll learn about our research programs, education initiatives, genomic medicine clinic and biotech entrepreneurship collaborations. We offer tours once a quarter. Click Here to register for the next upcoming tour. HudsonAlpha offers a number of scientific conferences on its campus each year, attracting scientists, clinicians and students from around the world. Click here to learn more about Immunogenomics, CROPS, Genomic Medicine Conference and our regular science seminars.